Northants have been dealt a blow with the news that off-spinning all-rounder Rob Keogh is set to miss the rest of the season with a serious hand injury. The 26-year-old has snapped the tendon in his finger and will need to wear a splint to keep it immobile for the next 12 weeks. The injury definitely rules him out for the whole of the Steelbacks’ campaign in the Vitality Blast which starts next Wednesday (July 4), and will likely see him miss the rest of the County Championship campain as well. Keogh said: “I’m absolutely gutted to be missing so much cricket, especially the Twenty20. “I had one of my better seasons personally in the competition last year, and all the players enjoy T20 – trying to get to finals day with that terrific atmosphere. He went on to explain why he will be missing, saying: “The splint will keep the finger still – because if it bends in the first eight weeks, the process will have to start again. 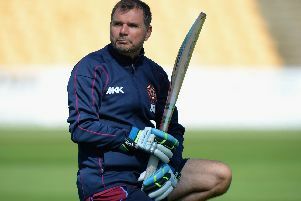 Northants head coach David Ripley said: “I feel for Rob because his season hasn’t really got going with injury through the pre-season period, and now another injury that’s ended his campaign.